Dated Brent crude oil prices in September increased on strong Asian demand, high geopolitical risk and fears of a tight crude market. Market participants are focused on US sanctions against Iran, barrel losses in Venezuela and are concerned that Saudi Arabia's spare capacity will not be sufficient to fill the void. Meanwhile, an aggressive speculative buying pressure is keeping oil prices up in the short-term, but quantitative analyst Vito Turitto forecasts Brent's volatility rising during October. The Dated Brent market enjoyed a rather good demand coming from Asia throughout the whole month of September, in fact, Far East arbitrage opportunities were particularly good and the Asian buying pressure concentrated on specific grades like ESPO, Forties and Ekofisk. However, the month of September has been heavily influenced by high geopolitical risk and fears of a tight crude market and this is precisely why, on September 25, Brent prices managed to break through $82/b for the first time since November 2014 while the Brent forward curve remained in a steep backwardation. There is general skepticism about Saudi Arabia's spare capacity and whether it will be able to ramp up its own production in order to counterbalance losses coming from Iran and Venezuela. Furthermore, the escalating trade war between US and China and US President Donald Trump's call for lower oil prices poured further fuel on the fire. Finally, global crude prices went aggressively up, around the end of September, when Saudi energy minister, al-Falih, stated that the oil market is balanced, adding that "the market is reasonably steady and we should just be dynamic and responsive and responsible&rdquo;. The only bearish news came from the US Energy Information Administration, which announced that October's shale oil production would go up and reach 7.59 million b/d. The Volatility Premium analysis shows that the premium has achieved one of its highest level over the last two years. Hence, it should decrease over the next weeks while prices should retrace. The Probability Distribution analysis suggests that Brent's volatility is oscillating within the lowest range achieved over the last two years implying that the probability for Brent volatility to increase and reach the 20-25% range, where it has a more than 34% chance to settle, are quite high. 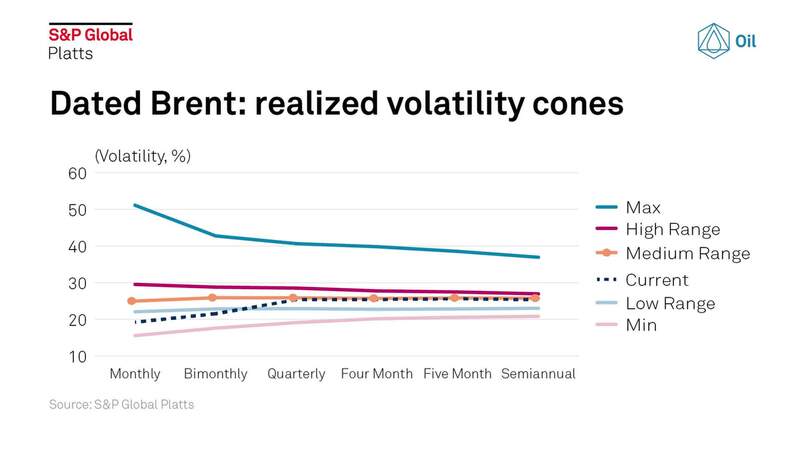 Finally, the Volatility Cones analysis indicates that the monthly and bimonthly figures on the current volatility curve are below the low range one implying that the fluctuation rate is trading at very low levels and that a spike in volatility is likely to happen in coming weeks. Overall, although the speculative buying and the significantly low volatility could last for a few days, Brent's fluctuation rate should spike in coming weeks while prices should move down. Until next time on the Snapshot—we'll be keeping an eye on the markets.